Garam Chashma-Chitral Road forks from Kunar River towards north though lush green countryside that is at its best after the months of harsh winters. 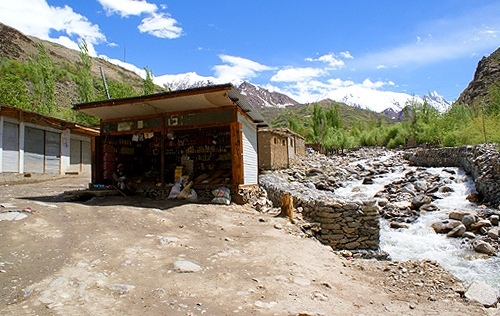 The pebbled road runs along Lutkho Gol and the scenery is ever becoming different. Sitting on the front seat, on my right I could see the distant snow covered Trich Mir Top changing its shades as per the slant of the sun. Nearly all the road passes though the mountain glen. Terraced fields and fragrant orchards of walnuts, apricots, grapes, apple, mulberries and brilliant alpine species of flowers are strung up the valley on the mountain walls. I was sharing my seat with another passenger - a local teacher from Garam Chashma by the name of Shah Pir who voluntarily took over as my guide and kept telling me the tales and pointing at things. During our journey from Chitral to Garam Chashma he narrated his risqué story of hunting expeditions. Moreover, he discussed every thing from the foreigners he had met to Soviet Occupation in Afghanistan and from ecology in the area to why Chitrali keep the legs of newly born babies tied so that they remain straight once they grow. He also lectured me on Tamur pedigree, which he said he belonged to. Silently, I bore the onslaught of knowledge. The driver had a long and leisurely break on a makeshift roadside teahouse in village Morgh. This is a busy midway stop. I had one of the tastiest (and much needed) cups of tea there and met couple of travelers from Karachi who were coming back from Garam Chashma. They advised me about where I should stay and eat while in Garam Chashma. The small village's claim to fame is "Patti" - clothe made by hand from raw wool. Patti is in great demand through out the country. There used to be a refugees camp during Russian occupation in Afghanistan in Garam Chashma - a tehsil headquarters of Chitral District. The open ground where Afghan children used to play and elder used to contemplate their future during forced exile is lying vacant as a strong reminder of the past. Herd of goats was resting in the vast ground. The track to Dorah Pass leading into Afghanistan is also deserted. Small bazaar in the town is lined with humble tea shops, eateries, modest provision stores that are mostly stocked once Lowari opens to road traffic during summers and a few shops selling Lajvard (Armenian stone) and Zamurrad (Emerald) that find their way in the town, for the tourists mostly. There is a high school in the town. People seem to be living in peace with themselves. No hurry, no worry. Cut of from the mainland, may be this is the best way of life for them. East of the main road near the town is a famous hot spring. The hot water comes from the hills. Near the residential area, a small steaming stream branch off to enter bathrooms and swimming pool (constructed by Chitral Scouts) before it joins the main course again. There are quite a few legends (or facts) famous about the hot spring. As per Shah Pir, the water of hot sparing is a cure to Gouts and numbers of other skin diseases. And, once upon a time, famous Daughter of the East used to come here to take bath. I only reveled into the hot water to freshen up. It was very comforting. Some of the rare wild life species are found in Chitral valley. But sadly, Musk Deer, Ibex and Murgh-e-Zareen are at the verge of extinction. Shah Pir told, "flying of Murgh-e-Zareen over someone's head is very lucky. It brings wealth and power." I do not believe in such things, but kept wishing through out my stay in Mir Khanni that if there is any Murgh-e-Zareen left, it should fly over my head. Later, however, I saw a domesticated huge Markhore in Chitral Scouts Officers Mess at Drosh and stuffed Murgh-e-Zareen in house of a local. The Chitralis are descendents of invaders - from Aryans to Macedonians. The presence of Kalash tribe and their ancient culture, the Khowar language spoken in the area and Mediterranean features of the people testify to this fact. History tells us that Chinese and Timur also subdued the area, which was later ruled by Kator clan till the middle of twentieth century. Chitral State acceded to Pakistan on independence and became an administrative district in 1969. The valley is landlocked in writers as the two passes, Shandur from Gilgit and Lowari from Dir are closed, and therefore, the life has not changed much in the valley during last few hundred years. Some time back, the National Highway Authority has proposed the construction of a low-cost all weather road from Nawan Killi unto Domail Nisar avoiding the Lowari Top which remains snow-bound during winter forcing suspension of all traffic between Chitarl district and the rest of the country. Over 10 feet of snow has been recorded in winters on the road passing through Lowari Pass. The 30 kilometers proposed Nawan Killi-Domail Nisar Road would save about 15 billion rupees: estimated cost on the Lowari Tunnel project. The work on the tunnel was undertaken some 16 years back but it was never completed due to low priority accorded to the project by successive governments. As per the preliminary study, the proposed road should take off from Nawan Killi in Dir district. The route to Zakani Kandao via Gat Kandao, also in Dir district, leads to Domail Nissar in Chitral district. A 13-km track already exists between Gat Kandao and Domail Nisar, which will require widening and adjusting of its longitude grade. Another 10 kilometers road from Domail Nisar to Mir Khanni also is there waiting for widening to accommodate two-way traffic. According to the topographic study along the proposed alignment the chances of accumulation of snow are negligible. There are 47 sharp curves falling in the same sliding zone on Lowari Pass while there is almost none on the intended route. Besides, the glacier and avalanches will not develop due to low area and favorable topography as compared to Lowari Pass. In addition, no snowstorms have been reported on the designed alignment whereas it is on record that severe storms cause huge human losses every year on the Lowari route. District Chitral will be connected with the main land if the road is approved and developed. The transportation of goods and passengers during winter when Lowari Pass becomes snow-bound will become possible. The new road is also claimed to reduce commuter's travel expenses as they have to spend more on air travel whereas goods, particularly essential food items, will be available at lower rates during winter due to less transportation cost. Journey from Chitral to Garam Chashma in photogenic valley is one of the most tranquil and absorbing experiences. But till the time the valley is not connected with mainland, round the year, "people consider Pakistan as another country," says Shah Pir.